My One Laptop per Child (OLPC) XO laptop arrived last week, and I have been playing with it since. For those who haven’t heard of this little beasty, intended to be given to children in the Third World, here is a video introduction by David Pogue of the New York Times. The Give One Get One deal that Pogue refers to is over now, but if you want an XO, you know where to get one. I am writing this using its simple word processor. I have a mouse and full size keyboard plugged in to the usb ports, as the keyboard is tiny…. …. and I’m not a fan of track pads, not even fancy track pads like on the MacBook. The monitor, however, is surprisingly decent, small, but very high resolution. I could write a book about this thing, but I’ll focus in this brief article on why the XO is not for the average user, and in the process reveal something about the structure of XO, or more precisely, its Sugar graphical environment and application suite. The important thing to understand about the XO is that it is intended to be an education appliance, as opposed to what most would think of as a pc or laptop. The degree to which you can easily configure and customize a toaster is limited primarily to how dark you like your toast, and the XO as appliance is similarly constrained. Working on a project where they could define constraints has given the XO developers a great deal of freedom to deviate from the norm in creating something specifically for the classroom. For example, hierarchical concepts like file systems and directories (“folders” to you Windows users) and such are hard, so why not do away with them? Instead, Sugar keeps track of everything the user does in the Journal. I don’t worry about saving this document as I type it, that’s the job of the Journal. And if I leave off, shut down, and return to it tomorrow, I can open it via the entry in the Journal and continue working. Likewise if I want to look at that photo I took with the XO’s built in camera, it will be in the Journal. If looking for pictures, I can constrain the Journal to display only pictures entries, and likewise for other application types. Or perhaps that should be activity types. Sugar is very much organized around the idea of “activities,” and this Journal model suits that. It might not be a good model for a corporation or news organization, but One Laptop Per Child is aptly named. 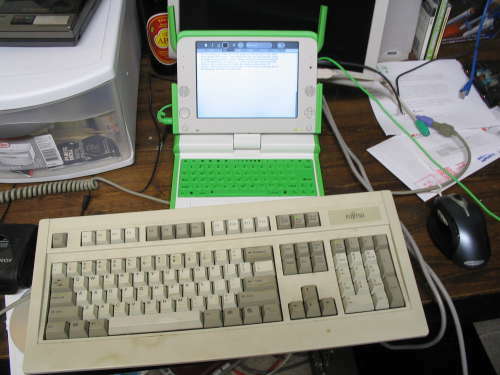 Even though, under the hood, it is running a multi-user operating system (the Fedora Core 7 distribution of Linux), the laptop boots directly into the Sugar environment for one user, named olpc. This one user can do many things but typically only one at a time, and serial journal suits that model very well. As you might guess, there is no Start button to bring up a mess of menus and potentially confusing options. Instead, there is the Frame. 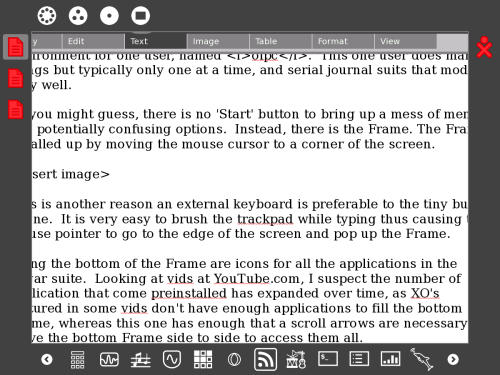 The Frame is called up by moving the mouse cursor to a corner of the screen. Along the bottom of the Frame are icons for all the applications in the Sugar suite. Looking at the XO in videos at YouTube.com, I suspect the number of applications that come preinstalled has expanded over time; in some of the vids, XO doesn’t have enough applications to fill the bottom Frame, whereas mine has enough that a scroll arrow is necessary to access them all. So you may be thinking, “Simplifying the computer’s interface sounds like a great idea, why would he say that this isn’t for me?” Well, let’s take the “Record” application (excuse me, that should be “Record activity“) as an example. Here we can record sound, video, or just snap a simple picture. The picture module even has a timer. Wonderful. And in the context of the environment the XO was designed for — a classroom full of kids, each with a computer connected via the OLPC mesh network — pictures, vids, files, and activities of all kinds can be easily shared or collaboratively worked on. It’s a technological masterpiece, a self-forming network, no sysadmin required. Wherever two or more XO’s are gathered within range of each other, there a network shall be. If one has access to the internet, then the mesh network has access to the internet. It is brilliant. But you, the average computer user, aren’t part of that wonderful scenario. Suppose you snap a shot and you want to send it as an email attachment to someone? First of all, there is no email application for you to send email with. Okay, no problem, there’s a web browser, right? So we can use web mail. I open the Sugar web browser. You may have read somewhere that this is Firefox. It isn’t. It uses the same code base, but is stripped way back. On opening it, you might think it doesn’t have an address bar. That is because the address bar does double duty as a title bar. If I pop the cursor into where the title is displayed (currently “OLPC Library”), it will switch to showing the address of the current page which I can replace with the address of my web mail. As an aside, it really is amazing how good most web sites look on this small monitor. I would not have thought it possible. There is a lot of genius in the XO hardware, but giving it a monitor this nice at such a low price point is a real achievement. Okay, I’ve started a new message, and have clicked on the add attachment link. Google gives me a field and a browse button. I click the browse button. Nothing happens. Why, I don’t know. But the browser was the first app I messed with when I got the XO, and I discovered as well that it doesn’t handle htaccess based authentication (simply won’t let you log in), nor sites that use self-signed certificates for secure server (SSL), just refusing to display, with no warning/option to continue. It also does a crappy job of most flash. It is the worst browser I have ever used, going all the way back to the early days of Mosaic. But supposing you knuckled-down, followed the instructions, and managed to get Opera installed, would you then be able to send that attachment? 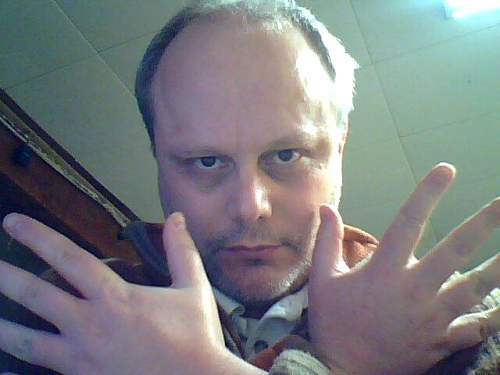 I fire up Opera, go to my web mail, and log in. Same as before, except this time when I click on the browse button, a browse dialogue pops up enabling me to search for my file and attach it. Huzzah! But not so fast. We don’t deal with such troubling concepts as files anymore. Taking a picture is an activity recorded in the Journal. How do you attach an activity? files; everything is a file, even devices are treated as files, so you know that picture just has to be a file somewhere if only you could find it. e611f43f-1db8-4224-9cae-ba381ad9dee0. Why? Because we don’t care about files! That’s all stuff the OS needs to keep track of, not fuzzy wuzzy humans like us! Unless, of course, we’re looking to send a picture as an email attachment to someone. Or if we need to find the file we just downloaded. That’s why you can’t simply use the default web browser to download Opera. The file would wind up in the datastore with an obscure hexadecimal filename, hidden as effectively as the Ark of the Covenant tucked away in that large warehouse at the end of Raiders of the Lost Ark . So is all lost? No. If you’re fine with the command line, the file command may yield some clues about which file is your picture. If you don’t mind giving up some of your precious storage you can easily install the uber-thumbnail viewer gwenview from the command line, since it is in the yum repository (su, then yum install gwenview). Nice, but it has a lot of associated dependencies which also get installed, so your limited storage will take a hit. Or we can try to function within the constraints using a USB memory stick. Here’s what we do. Stick the USB stick into one of the USB ports. Go to the Journal. At the bottom you will see an icon representing the USB stick. Theoretically . . . I don’t see it. Hm again. Perhaps a reboot is in order. Find the Journal entry for the image, and drag it onto the USB icon, thus copying it. The USB drive will be mounted under /media and will have a meaningless name, but not so bad as the file names in the datastore. So I find it using the GoogleMail browse for attachment dialogue, select, send the message on its way to myself at another address, and confirm that yes, indeed, it is possible to send email attachments from the XO! All you need is Opera, a webmail account, and a USB stick. Of course if your cute, little Linux based laptop was an Asus eee pc or a CloudBook, you could have just added the image as an email attachment in your email application without the fuss and complication. I don’t want to give the impression that I’m down on the XO. I’m actually really fond of it. Now that I have Opera installed, it can do email, download files, and, of course, surf the web more than adequately. If nothing else, it’s a wonderful little portable web browser, which is really all I need when I’m between desktops. And I also managed to install an mp3 player (again, required some geek chops), so not only is it a small computer, it’s also a very large ipod! And for the kids these things are designed for, the whole OLPC idea is from beginning to end absolutely brilliant. A classroom full of these appliances, one for each kid, and one for the teacher, all networked automagically together, facilitating collaboration, and learning and all that good stuff… sheer genius. So while it might not be the best laptop for a regular computer user, it is better than anything Microsoft, or Asus, or whatever corporation could have come up with for this very specific role in the classroom. And, of course, if you have the geek chops it is a wonderful geek toy. You can have your girly MacBook Air, my laptop has more character by far!